Property developer Glomac Bhd wants to sell off block B of its building at the Kelana Business Centre in Selangor for RM30 million. This year alone, Glomac has sold two buildings for RM72.6 million, namely the 13-storey Wisma Glomac 3 in Kelana Centre Point and a building at Wisma Glomac. Glomac is also in the later stages of finalising by the end of the month, a sale of a 25-storey building at its Glomac Damansara project to a government agency for RM200 million. "We are selling the buildings so we can use the money and develop bigger projects. The proceeds from the sale of the properties will form part of our war chest," executive vice-chairman Datuk Richard Fong Loong Tuck told Business Times. Glomac slashed its gearing from 0.5 to 0.12 times since a year ago via the sale of assets, he said. Glomac Tower, located near the Petronas Twin Towers was sold to a Bumiputera firm for RM577 million in December 2007 and proceeds from the sale are being recognised now as construction progresses, Fong said. Elsewhere, Glomac Galleria in Sri Hartamas featuring 20 units of four-and-a-half-storey shop offices was sold en bloc last year for RM100 million. On the fresh asset sale, Fong said that despite block B of the building being put up for sale in the market recently, the company has received numerous offers. Fong said Glomac will do better this year, with net profit and revenue increasing by 10-20 per cent. For the fiscal year ended April 2009, it posted a net profit of RM32.3 million on a revenue of RM351 million. "We have had better sales this year, thanks to financial packages that we had launched earlier in the year. 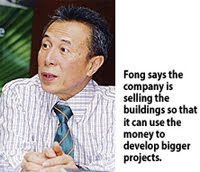 We are also getting income from Glomac Tower and Glomac Galleria, and from our Seri Bangi project," Fong said. Seri Bangi comprises double-storey terraced houses and shoplots worth RM121 million, and half of the residential properties were launched in April and August this year. "We launched 94 units and 76 units of double-storey terraced houses in April and August respectively and almost 70 per cent were sold within two weeks after the launch. We were caught by surprise. "We are going to launch the final 88 units early next year, each priced from RM360,000. We are expecting a similar take up," Fong said. DIJAYA Corp Bhd's development at the 250ha Tropicana Golf & Country Resort in Petaling Jaya, Selangor, is almost reaching the tail end, with the scheduled December launch of the RM745 million Tropicana Grande and Tropicana Avenue project. The two are are among the final three or four developments left in Tropicana. According to managing director Datuk Tong Kien Onn, there is only 3 per cent or 7.5ha of land to develop in Tropicana. Tropicana Grande and Tropicana Avenue will use 2.08ha and 2.3ha each. The remaining land will be used to construct purpose-built office towers for investors, Tong told Business Times in an interview in Petaling Jaya. 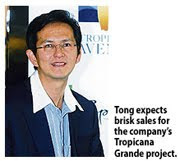 Tong said Tropicana Grande is the last residential development in Tropicana and he is expecting brisk sales at the launch as it has ready buyers. Tropicana Grande will featuring four crystalline blocks. It will offer 300 units, priced from RM600 per sq ft, Tong said. "We are optimistic of sales. The market is improving and there is demand for properties overlooking a golf course. Our pricing is less than half of what is being offered at the KLCC area," Tong said. Dijaya is targeting existing Tropicana home buyers, and investors from Singapore, Dubai, Hong Kong, South Korea and Japan. To accelerate sales from foreigner property buyers, Dijaya will launch Tropicana Grande in Singapore in December, Tong said. Tropicana Avenue, a lifestyle commercial development, will comprise three blocks of nine and 11 storey offices, worth RM205 million. There will be 359 shop offices and 38 loft offices parked in seven to nine floors, that will seat on top of 50 retail lots in two floors. "At the moment, we are looking to lease the retail units to control the mix so we can create a lifestyle for our buyers. We will be selling the office suites at RM350 per sq ft," Tong said. Tong said he expects Dijaya to surpass its 2009 revenue target of RM260 million this year, attributed by sales from the new properties. Over the past seven months, Dijaya has achieved RM215 million in sales, or 70 per cent of its target. For the financial year ended December 31 2008, Dijaya posted RM244 million in sales. KUALA LUMPUR: The Malaysian Rubber Board (MRB) plans to monetise some of its existing land bank assets, especially those in the Klang Valley, to support the increasingly high operating costs in terms of research and development, patents and information on manufactured rubber goods. Datuk Dr Kamarul Baharain Basir says MRB’s major research achievement is in tissue culture and genetic transformation. Its director-general Datuk Dr Kamarul Baharain Basir said MRB currently had an estimated RM1bil of land bank assets nationwide. “The Government has strongly urged MRB to follow in the footsteps of major corporations and government-linked companies, which have either sold or leased their holdings like buildings or land bank, to monetise their non-core assets,” he told StarBiz. Kamarul said MRB was now working closely with its property cooperative to look at how best to monetise its land bank assets in prime locations like Sungei Buloh and Jalan Ampang. “We are keen to develop part of our 1,700ha Rubber Research Institute in Sungei Buloh into commercial centres. “However, our development (in Sungei Buloh) must not duplicate the nearby Selangor Vision City development,” he said. Having said that, MRB also does not want to see too much depletion in its assets as it strives to generate regular income to support its operations. Under the Ninth Malaysia Plan, the Government has allocated RM113mil for MRB, which is the statutory authority for the management of the country’s rubber industry. “We plan to seek a higher allocation of about RM300mil under the 10th Malaysia Plan but we don’t know how much we will get this time,” he said. According to Kamarul, MRB is the world’s most “referred” rubber organisation among international rubber set-ups seeking information on the upstream, midstream and downstream activities in the industry. “Our core activities are in research and innovation in both upstream and downstream, crop management, improvement and protection as well as in biotechnology,” he said, adding that MRB’s major research achievement was in tissue culture and genetic transformation. “We were able to create a transgenic rubber tree that can enhance crop productivity, production of valuable protein in the latex and has bigger girth tree trunk for timber production as well as high resistance to diseases,” he said. MRB recently launched its latest high-yield rubber clone, the RRIM 3001, which can boost latex production to over 2,000kg per hectare a year compared with the average yield of 1,430kg in 2008. When mature, the RRIM 3001 tree could also be a good “rubber timber” source for the local furniture industry. “Currently, rubber timber represents 80% of the raw material used in the local furniture industry,” he said. On another note, Kamarul said the price of natural rubber was tracking well with crude oil and that demand from China was encouraging. China takes up about 35% of Malaysia’s total natural rubber production. He said tyre grade SMR 20, currently trading above RM6 per kg, boded well for rubber planters, as the cost of production was about RM3 per kg. The Nomad Group Bhd, an office space provider, has allocated some RM100 million to expand its serviced apartment portfolio and is eyeing properties in Thailand and Singapore. The group is now negotiating to buy an 80-room serviced apartment in Bangkok, Thailand, for up to RM60 million. Chief executive officer Hew Thin Chay said the deal could be completed as early as next year. The average occupancy at this property is now only 40 per cent while its average room rate (ARR) is around RM200, providing ample room for improvement. 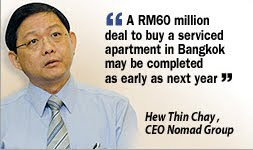 In an interview with Business Times, Hew said The Nomad was also eyeing Singapore but has yet to find a suitable property there. In Malaysia, The Nomad was not keen to buy more hotels or serviced apartments but it was open to managing them instead. It has been approached to convert a 200-unit condominium on Jalan Tun Razak into a serviced residence and manage it. In other countries, it is looking at the possibility of operating serviced apartments in Chennai, India, and may consider Indonesia in the future. Meanwhile, Hew said he expects the group to return to the black this year, as it sees the money coming in from the various investments it made last year. For the financial year ended December 31 2008, The Nomad incurred a net loss of RM7.63 million on the back of RM25.85 million in revenue as a result of start-up costs. "We have had eight openings, six of which are offices. It takes start-up businesses about 12 months to mature," Hew said. Its investment last year include The Nomad Offices at Etiqa Twins, The Gardens Mid Valley and Pavilion Kuala Lumpur. Together with its space in Menara Hap Seng (which opened in December 2007), it has 80,000 sq ft space, making it the largest serviced office provider in the capital. The Nomad has ventured into the Gemadept Tower in Ho Chi Minh City, Vietnam, and Interchange 21 in Bangkok, Thailand. It also bought the iOffice and Menteng Office Park in Jakarta, Indonesia. "In the first half of 2009, we will incur a loss but post positive earnings before interest, taxes, depreciation and amortisation. But I think, by end of the year, we should make profits," he said. In the first quarter to March 31 2009, it posted revenue of RM7.44 million and net loss of RM235,000. Its cash cow is the Raffles Place in Singapore, which provides it with RM1.6 million a year in operating profit. The group makes 60 per cent of its revenue from foreign markets. It is eyeing Hong Kong, South Korea and Taiwan for the serviced office business. 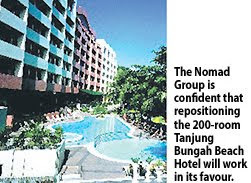 Serviced office and residence specialist The Nomad Group Bhd has taken over the management of the Tanjung Bungah Beach Hotel in Penang as part of a branding exercise. The hotel will be renamed The Nomad Penang after a facelift to raise its rating to four stars from three. The property is set to undergo a RM2 million refurbishment exercise, which will see it being transformed to cater for a market mix of business travellers and the information technology-savvy, The Nomad Group chief executive officer Hew Thin Chay said. "We have a five plus five-year contract to manage the hotel. We plan to reposition it towards a new market segment," Hew told Business Times. The hotel is owned by Plenitude Bhd. "We are in Penang to establish a network and have a branding presence," Hew said. The 200-room hotel enjoys 80 per cent occupancy and garners an average room rate (ARR) of RM100 a night. Currently, most of its business comes from the low-yielding sector, such as through travel agencies. Hew is confident that repositioning the hotel will work in its favour, especially since it is located close to the island's city centre. He described the hotel as "a city hotel with a beachfront", noting its position along Jalan Tanjung Bungah, which is between George Town and Batu Ferringhi. The hotel has already seen an improvement since The Nomad Group took over its management in March this year. Occupancy has touched 90 per cent and the ARR is RM110. The Nomad Group expects to make a net profit of RM300,000 in the first year of operating the hotel. Hew expressed his optimism that occupancy will be as good and its ARR can reach RM120 after the upgrade is completed early next year. The Nomad Group is also managing the The Nomad SuCasa serviced suites in Kuala Lumpur and is in the process of acquiring the Novotel Kuala Lumpur City Centre. SRI Lanka is calling on foreign investments to pump prime its economy which had been ripped by over 30 years of civil war. 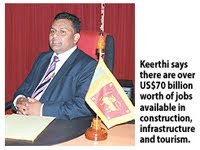 State Corp (Pvt) Ltd (SCorp) managing director and chief executive officer Keerthi Sri Weerasinghe said there are over US$70 billion (RM246 billion) worth of jobs available in construction, infrastructure and tourism. Keerthi, who is chairman of the Coconut Development Authority under the Ministry of Plantation Industries said there are also contracts to be undertaken in mineral mining and housing. "Because of the war, we could not undertake a lot of developments. Many buildings, roads and bridges were ruined during that time. We are now opening doors for investors to come in and develop the country for us," Keerthi told Business Times in an interview in Kuala Lumpur recently. The present government has introduced a 10-year economic development policy the "Mahinda Chintana" where the focus is to steer investments to vital sectors such as agriculture and infrastructure development to pump up the economy. Bilateral investment agreements, supported by a constitutional guarantee, provide strong protection to investors in Sri Lanka. Such an agreement exist between Sri Lanka and Malaysia. Keerthi said a few Malaysian firms have made successful foray into the country and the situation was viable for new players to come in now. Malaysia remains the largest investor in the country, mainly in telecommunications, infrastructure and property development. Companies such as Dialog Telekom plc, a unit of TM International Bhd, MTD Construction Sdn Bhd and HeiTech Padu Bhd had ventured into Sri Lanka despite the war. "We are an open economy and the government is interested to invite investors in oil and gas (O&G) and agriculture. We have identified six sites in north-west and south of Sri Lanka for O&G activities. We are also looking to revive a cement factory which had been shut down during the war and are calling for interested parties to bid," Keerthi said. Keerthi said the Indian and Chinese governments, and the International Monetary Fund would lend their support financially while building materials were readily available for use.